It should be easy to name 3 breeds of dogs – but can you do it under the pressure of 5 seconds twisting down, and with the other players staring at you, waiting for you to get flustered? Time's not on your side, so just say what comes to mind and risk ridiculous answers slipping out as time twirls down on the unique twisted timer! It's all in good fun with this fast-paced game where you have to Just Spit It Out!™ 3 or more players. Time's not on your side, so just say what comes to mind and risk ridiculous answers slipping out as time twirls down on the unique twisted timer! It's all in good fun with this fast-paced game where you have to Just Spit It Out!™ Includes 400-576 questions, 5-second Twisted Timer, and rules. 3 or more players. THINK FAST, ACT FAST! Be the first to complete the challenge and get your brain back on track. Quickly slide and connect your thoughts into the right order, then, be the first to complete the correct action to win. These sliding puzzles have 16 different start and stop points, so creating a clear train of thought is always a new and exciting challenge. A clever twist on classic sliding puzzles, this game is perfect for solo solving or racing against friends! 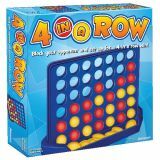 Line up four in a row on a whole new level in this one of a kind strategy game! 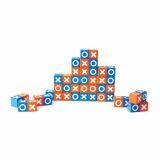 Players build their wall to victory with vibrantly colored blue and orange bricks engraved with white X's and O's. The first player to align four of their symbol or color in a row wins the game and claims the wall! But watch out! Each brick contains both your symbol and color as well as those of your opponent. So each time you add a new piece, you risk helping your opponent win the game! Brix is a uniquely creative game that is fast to learn but employs a complex strategy that older children and adults will love! The Fast-Paced Number Dice Game! Students compete in this fast-paced number dice game to arrange their dice roll (2 to 7 dice) into the lowest or highest number based on the dealer's roll of the greater than/less than die. The dice game provides number sense from tens to millions place value depending on number of dice used by each student or team. This game can be played at any grade level as the number of dice each player uses dictates the difficulty. The smart player knows ordering their roll in ascending or descending consecutive order is the key to winning, plus the luck of the roll. Includes 4 sand timers ranging from 15 to 60 seconds. The shorter the time for players to create their number, the wilder the game becomes! 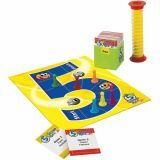 This game will boost student proficiency with greater than/less than, place value, consecutive order and number sense skills while having fun! 2-6 players or teams, plus dealer. 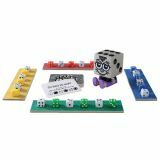 The game comes with 36 white dice with dot patterns 1-6, plus 6 blank white dice, 6 green “dealer” dice with dot patterns 1-6, plus 1 blank green dealer die, 1 orange greater than/less than dealer die, 4 sand timers, (1 each 15, 30, 45 seconds & 1 minute), 50-page score pad, re-sealable bag to store dice, game rules sheet with reproducible score sheet on reverse side. Basic game play: The teacher or designated student uses the green dice and orange greater than/less than die to deal out the number challenge. For example: If the game is using numbers to 5 place values (ten thousands) the dealer rolls 5 green dot pattern dice with plus the orange >/< die. The dealer rolls > and arranges the 5 green dice into the number. 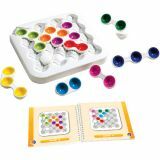 The appropriate sand timer (15 seconds to 1 minute) is turned over and the 2-6 players roll 5 white dot pattern dice. They must now quickly arrange their dice into a number they think is greater than the green dice number. The student with highest number that beats the dealer and other players wins the round. Had the orange die been <, then the players or teams would be trying to get the lowest number. The blank die can be added to create 7 place values as a zero. The zero may not be used as the first digit. The player or team that wins the most rounds gets first place. As students master ordering dice to create the highest or lowest number, you can add place values (more dice) or shorten the time per round with the sand timers to increase the pace and fun! 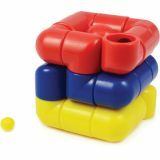 The Cubix Tube is a difficult brain teaser with a hollow maze built inside of a brightly-colored, moveable collection of tubes. Lining up the colors is not enough! The hollow maze must be aligned accurately for the ball to pass through the tubes from top to bottom without hitting a solid wall. 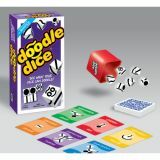 See What Your Dice Can Doodle!™ Create a ‘doodle' with a few rolls of the Doodle Dice™. When you build a doodle that matches one of the cards, you take that card. Collect one card of each color and you win! It's the fun, challenging way for everyone to be a ‘doodle artist'! Contains 6 dice, playing cards, shaker cup, and instructions. 2-6 players. Ages 6 and up. The brilliant Dr. Eureka has important experiments for you to complete! 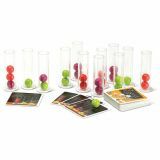 Pick a challenge card, 3 test tubes and 6 colorful balls to solve his scientific formula. Carefully move your materials from tube to tube without dropping them, and position them as illustrated on the challenge card. 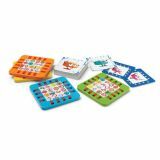 This brainteasing party game can be played solitary or competitively. 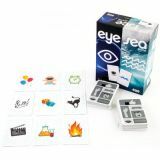 The high quality components and the creative concept make it a challenging game for the whole family. It's a race to the dice! The first player to complete ten math challenges and grab Steven wins this fast-paced, dice-rolling race!